As the weather gradually becomes colder you may find it harder to will yourself to stand outside and wash your car, especially when you have already turned the outside water off to ensure there is no freezing of the pipes. You may find it easy to put off for a few days, or even a few weeks. However, getting a car detail in the winter is one of the best things to do! A winter car detail is simply getting an auto detail in the winter months. Eventually, when the snow hits the ground and the salt hits your car you will see the inevitable buildup of nasty gunk and the white lining of road salt building up on its side. This may seem to just be an aesthetic thing that can be put off until the end of winter, but for those with newer cars, there is a greater sense of urgency to clean off your car. What’s the Danger of Winter to a Car? When the roads are salted during the winter it is to create a more stable driving condition for those traveling along the road. The salt makes contact with the snow, or ice, and immediately begins melting it down to water. This process allows cars to gain more traction and overall friction when driving. This is especially important for commuters who still need to make their way to and from work every day, ensuring their safety and ability to make it home and back with the least amount of hassle. Protect Your Car All Winter! But what most people overlook is when the salt melts the snow and ice, the combination becomes a mixed slush of ice chips and high-density salt water, creating an extremely corrosive element for metals and wiring. When the salt sits on the road after melting, cars passing by are bound to kick it up and pass it onto nearby cars either on the sides or behind them, creating a thin film of salt water on the vehicle itself. This film may seem harmless, but on a vehicle, this creates an advanced corrosion process that will attribute to premature rusting on major exposed components such as your muffler, coil springs and most importantly the frame of the car. This is especially bad for those living in a north eastern climate due to the high number of commuters present on the road and the kickback received from the cars in front of you. The simplest thing to do would be to take out your phone, go on Google and type in “car detailing near me” and start calling up different auto detailing centers to weigh your price options. 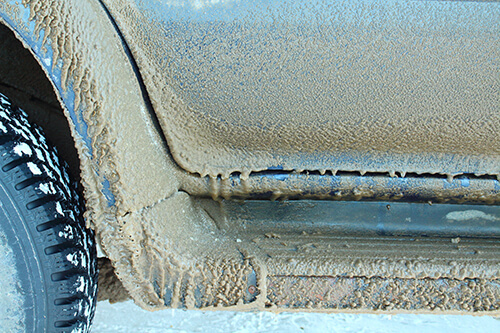 Depending on the auto detailer you find they may offer a winterize plan. This plan usually details the car like normal but will provide solutions to spray underneath your car to provide a layer of protection. This will deflect the corrosive elements hitting against the bottom of your car and will provide protection from the salty substance that causes the corrosion of your vehicle’s underside. Unfortunately, this is only one step in the process of keeping your car care under control in the winter months. Since this salt is on the ground, covered in snow and ice you will collect this mixture on the bottom of your shoes and transfer it to the main interior of the car. You could always follow up your “auto detailing near me” search query with “car interior detailing near me” and have the inside of your car detailed and cleaned from the salt that collects inside over the winter months. Otherwise, you may want to look into purchasing a laser-measured floor mat that will guard your interior completely from all elements, or look into having a mobile car detailing service coming to you. It’s also important to mention that DriveSmart’s Ultimate® Savers Club provides not only savings on all covered car repairs, but exclusive benefits and discounts as well. Each year, hundreds of thousands of drivers throughout North America save thousands of dollars with DriveSmart. As a member of the Ultimate® Savers Club, you’ll be able to claim discounts ranging from entertainment and travel to car maintenance and repairs.